Justice Dawn Gregory (left) and Chief Justice, Roxanne George-Wiltshire. 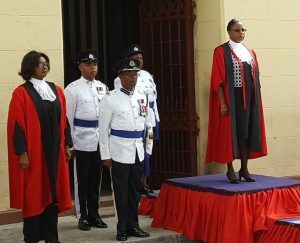 Chief Justice, Roxanne George-Wiltshire and High Court Judge, Dawn Gregory are to be sworn in Wednesday as Court of Appeal Judges, according to well-placed sources. They are due to take the Oaths of Office before President David Granger at his official residence, State House. This will pave the way for the Court of Appeal to resume sittings since the retirement of Justice Carl Singh from the post of Chancellor on February 23, 2017 and the proceeding of Appeal Court Judge B.S. Roy on pre-retirement leave. 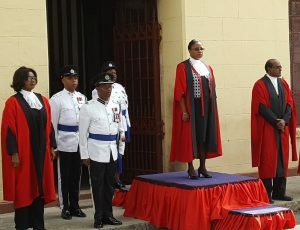 Almost two months ago, President Granger had publicly committed himself to swearing in the Court of Appeal judges upon the recommendation by the Judicial Services Commission (JSC). Shadow Attorney General and Minister of Legal Affairs, Anil Nandlall welcomed the decision to appoint the judges, but said he remained concerned that a number of Attorneys-at-Law, who have been recommended by the JSC, have not been appointed judges. Nandlall said the elevation of Justices George and Barnes as Apellate Court Judges now creates even more vacancies to be filled at the High Court. Left to right: High Court Judge, Dawn Gregory; Chief Justice Roxanne George-Wiltshire and High Court Judge, Rishi Persaud. “Now that judges are now being pulled from the High Court, you have more vacancies being created in the High Court and you are not having corresponding appointments being made and that is the reason why the previous recommendation of the Judicial Service Commission had two elevations to the Court of Appeal from the High Court and two elevations to the High Court,” said Nandlall who is a former Attorney General and Minister of Legal Affairs. The JSC in February 2016, he said, had recommended Justices Rishi Persaud and Dawn Barnes to be elevated to Court of Appeal Judges and Attorneys-at-Law, Damone Younge and Sandil Kissoon to be appointed High Court judges. Against the background of the fact that a Chief Justice is an ex-officio Court of Appeal judge, Nandlall did not see anything wrong, but said usually a Court of Appeal Judge is appointed Chief Justice.